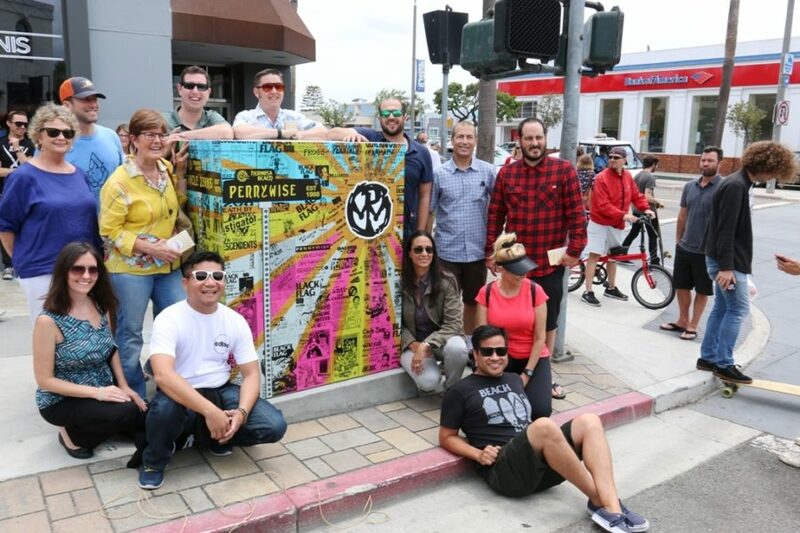 “This unveiling will make Hermosa Beach a beacon to the punk world,” Leadership Hermosa Beach board member and Hermosa parks and rec chairperson Jani Lange declared Saturday afternoon. 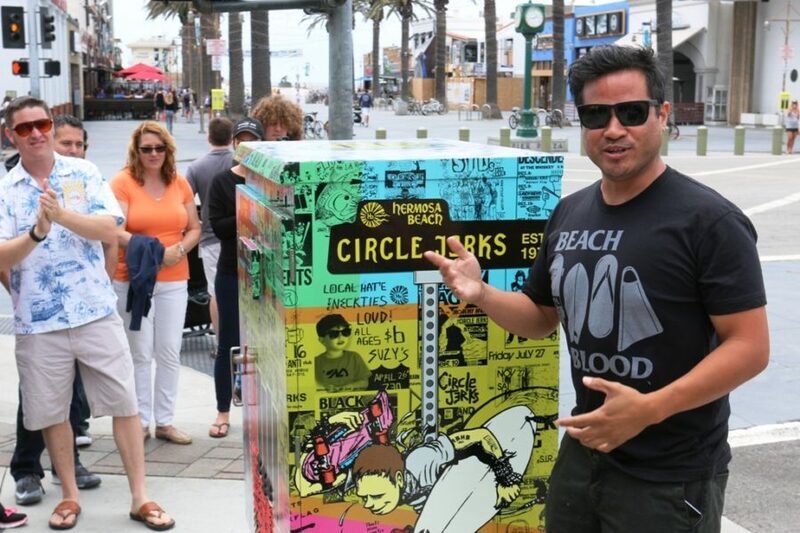 The occasion was the unveiling of Daniel Inez’s mural on a utility box at the southeast corner of Hermosa and Pier avenues in downtown Hermosa. Until Saturday, the utility box’s sole function was to control the busy intersection’s signal lights. 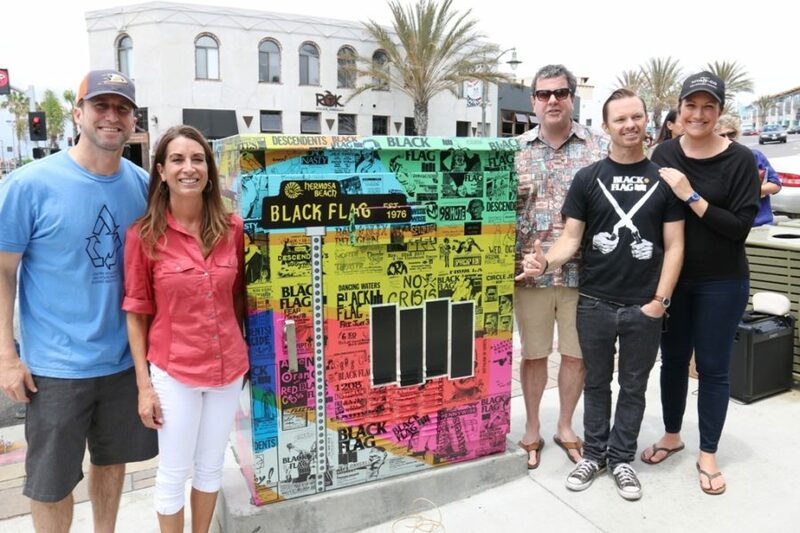 Inez wrapped the square, five-foot tall utility box with a celebration of Hermosa’s punk music history. The utility box’s four corners bore street signs reading Black Flag, Descendents, Circle Jerks and Pennywise. All were seminal punk bands based in Hermosa and known worldwide. Inez is a Hermosa Beach artist and designer, whose company M1SK (Made 1n Southern Kalifornia) draws heavily from Hermosa’s music, skate and surf cultures. Hermosa Beach council members Jason Massey and Carolyn Petty, city manager Tom Bakaly, Jani Lange and coucilwoman Stacey Armato. 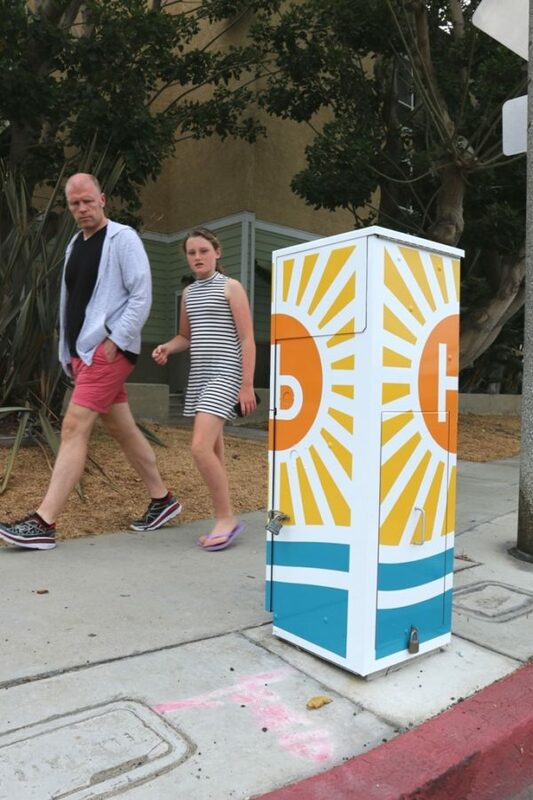 Seven other Hub (Hermosa Utility Box) murals were also unveiled on Saturday. The project was organized by Leadership Hermosa Beach, which prepares residents for civic leadership roles. Chris Miller’s tribute to early Hermosa. Just north of Inez’s punk tribute is Chris Miller’s tribute to early Hermosa, when the town was divided into tracts named after famous poets. Her mural includes early surfing and beach photos and inspirational quotes from Shakespeare, Tennyson Keats and Longfellow. 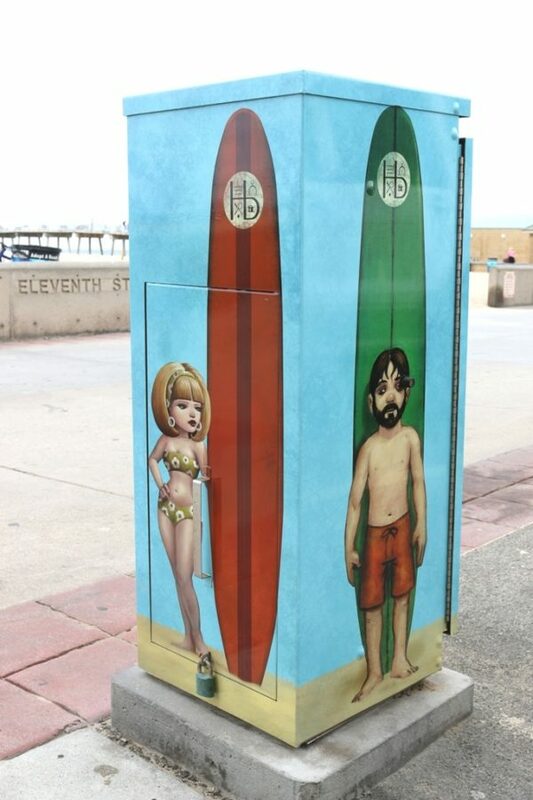 South of Pier Avenue, next to Scotty’s on The Strand restaurant, artist Rob Dob covered a utility box with four, troubled looking, adolescent surfers. Daniel Inez’s reinterpretation of the City of Hermosa Beach logo. 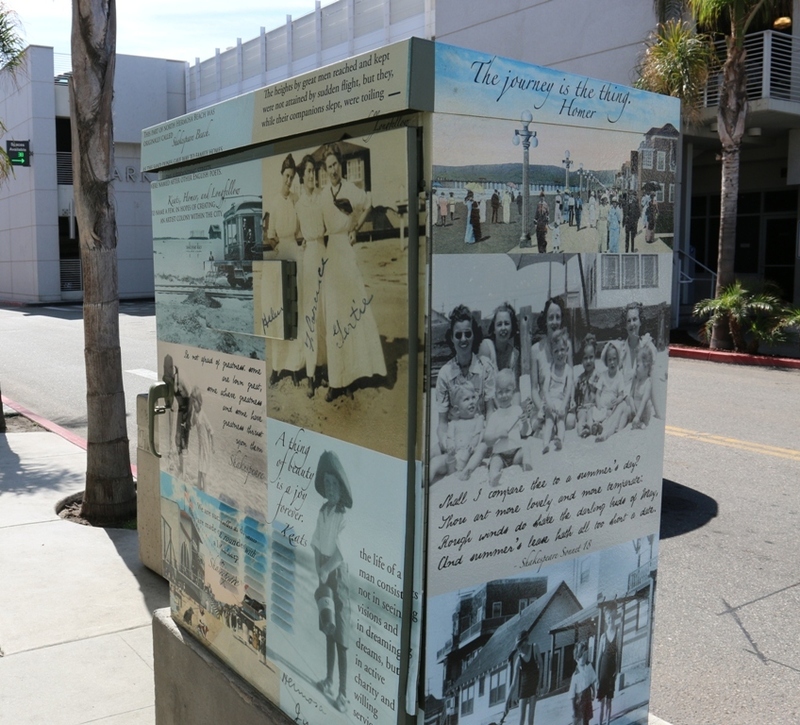 Inez designed a second utility box on the south end of Hermosa, at Herondo Street and Monterey Avenue. The design is a brightly colored interpretation of the Hermosa Beach city logo. Tributes tp Hermosa’s surf culture by Lisa Arnett and jeff Fleger. 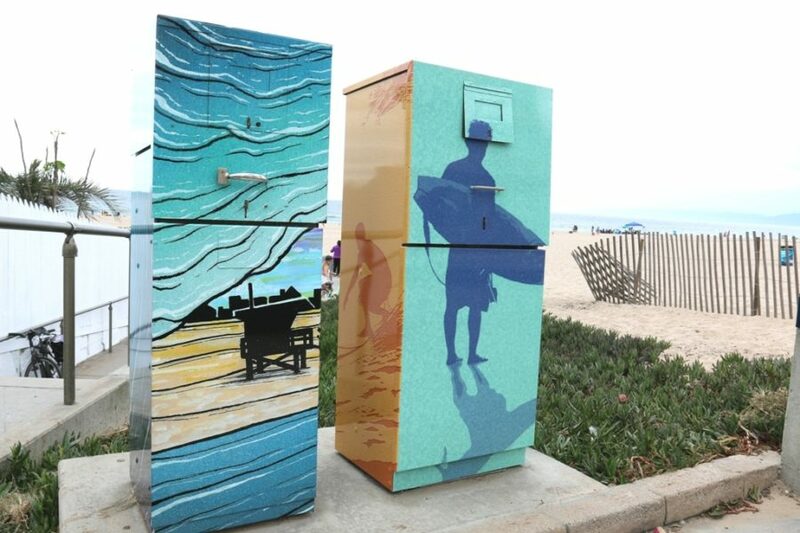 At the north end of town, on The Strand at the Hermosa and Manhattan Beach border are two tall, narrow utility boxes designed by Jeff Fieger and Lisa Arnett. Both artists’s designs celebrate Hermosa’s surf culture. 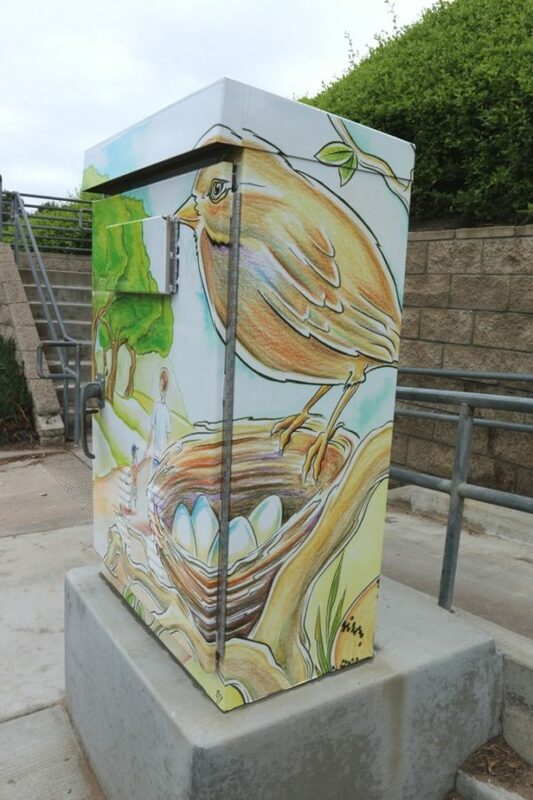 In the center of town, along the Green Belt, across from Valley School, Jake Tedesco covered an elevated utility box with a sparrow guarding her eggs opposite a garden scene with a lizard, a bee and flowering vines. Carisa Catalina’s art deco restatment of the Hermosa Beach city logo. 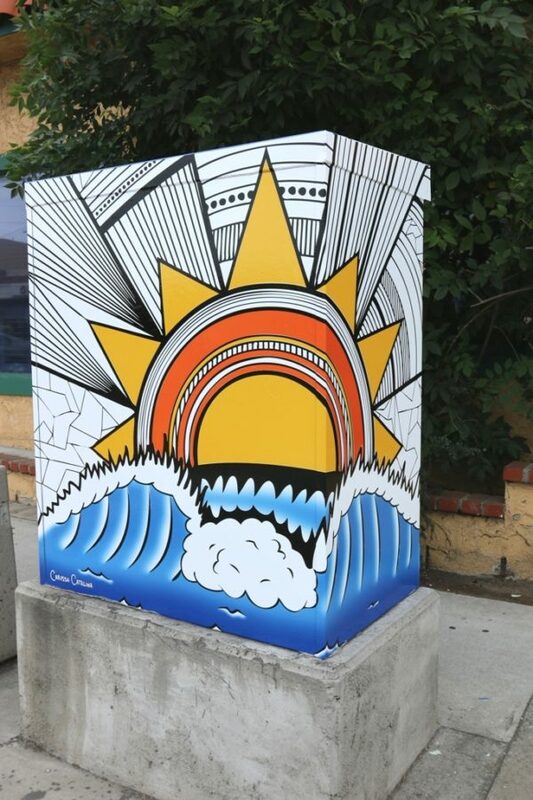 On a utility box on the east side of town, at Prospect and Aviation Boulevard, artist Carissa Catalina drew an art deco-inspired Hermosa sun logo hovering over a breaking wave. The vinyl murals were printed and installed by Spin Imaging in Long Beach, which also installed John Van Hamersveld’s “History of Surfing”mural at 14th Street and Hermosa Avenue and will be installing Bo Bridges “Hermosa Volleyball” mural on Saturday, June 26 on the city parking structure at 13th Street and Beach Drive. The Van Hamersveld and Bridges murals are the fifth and sixth of a series of 10 murals produced by the Hermosa Murals Committee.